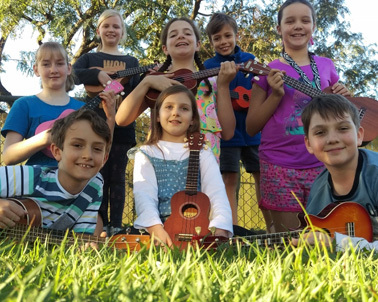 The Free Range chUKES are aged 6 – 15, and love to play old and new music that has interesting picking parts, good vocal lines and the occasional challenging chord. The chUKES select a variety of songs from popular, media and folk sources. Their set will include a journey through the last six decades and a few of their favourite recent popular songs. They sometimes supplement their ukes and voices with percussion instruments to create original and new sounds. The Free Range chUKES look forward to inviting you to join in for a few numbers – they’ll help you out and not make it too tricky for you. If our primary school-aged members can play it so can you!